Star Cinema brings together today's hottest young stars - Enchong Dee, Enrique Gil, Kean Cipriano, Xian Lim, Jessy Mendiola, Cristine Reyes, Megan Young and Julia Montes in one feel good youth movie inspired by the songs of the hit 90's Pinoy rock band Eraserheads titled "The Reunion". 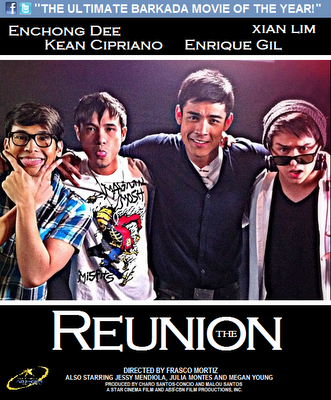 The Reunion follows the journey of Lloyd (Enchong), Bogs (Enrique), Pat (Kean) and Joax (Xian) after their life in high school and now struggling in their everyday lives. From being popular in the campus their lives changes and leads them to the things they never imagined to happen. Wanting to make it right, Lloyd, Bogs, Pat, and Joax trace back to their lives searching where things went wrong in order to change their future. Going back to memory lane brings back all the fun they had in their high school lives including first love and heartaches. With all this will they finally make things right? Directed by Frasco Mortiz, the movie which will open in theaters nationwide on August 15, also stars Alodia Gosengfiao, Tom Rodriguez, Matt Evans, Bangs Garcia, Joseph Marco and Ms. Gina Pareño.